Run Windows Media Player to play a song or listen to an album. To run Windows Media Player, choose it from the All Programs menu: Click the Start button and choose All Programs and then Windows Media Player. You might also find the Windows Media Player’s icon on the Quick Launch bar. 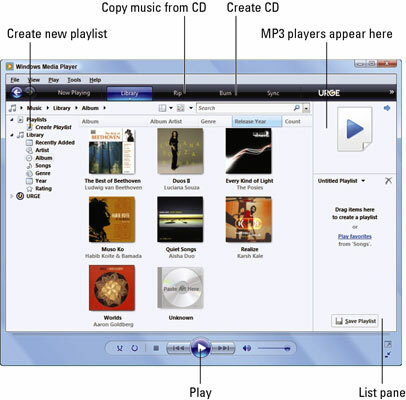 Windows Media Player sports a simple and easy-to-use interface, as shown in the following figure. Media are organized on the left. You can find your music listed under Library and get even more specific by choosing a category, such as Album or Songs. Run Windows Media Player from this screen. When running Windows Media Player, to play a tune or listen to an album, click to select what you want to listen to and then click the big Play button in the lower center of the Windows Media Player window. Windows Media Player isn’t the only digital jukebox available for Windows. Other choices include Yahoo! Music and Apple’s iTunes. Note that Windows Media Player is the jukebox that Windows prefers. You can change the look of Windows Media Player by choosing a new skin, or visual interface, from the View menu. The previous figure shows Windows Media Player as it appears in a standard window without any particular skin applied.